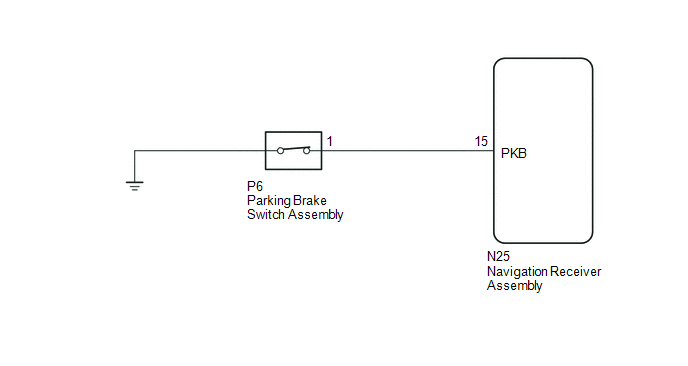 This circuit is from the parking brake switch assembly to the navigation receiver assembly. 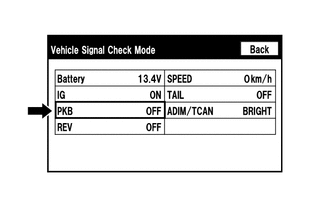 (a) Display the "Vehicle Signal Check Mode" screen (See page ). (b) Check that the display changes between ON and OFF according to the parking brake operation. This display is updated once per second. As a result, it is normal for the display to lag behind the actual parking brake operation. (a) Disconnect the N25 navigation receiver assembly connector. (b) Disconnect the P6 parking brake switch assembly connector. (a) Remove the parking brake switch assembly. (b) Inspect the parking brake switch assembly.